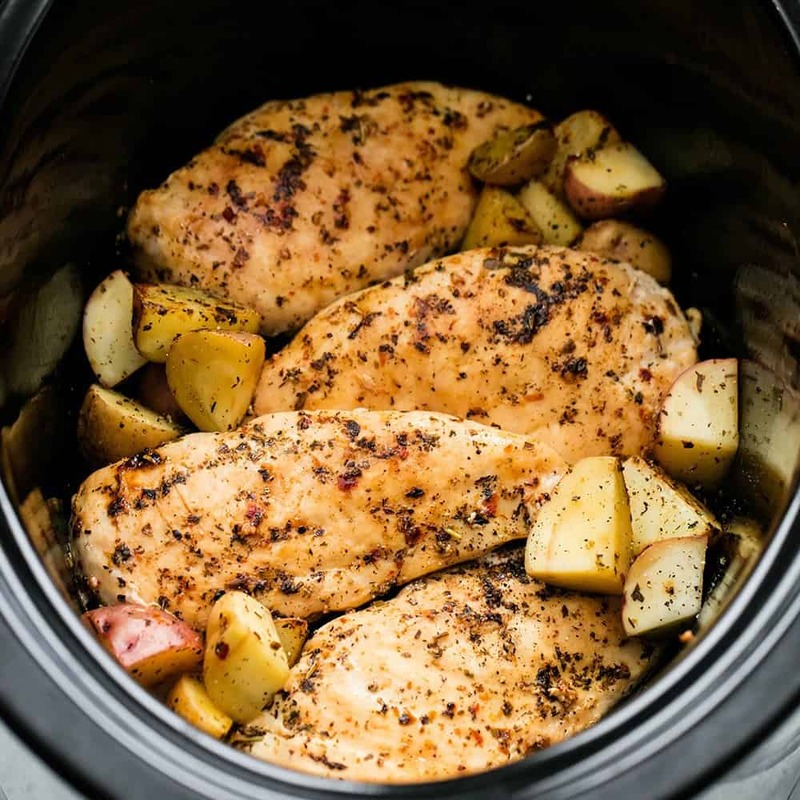 Slow Cooker Italian Chicken and Potatoes is such an easy meal to make but packed with such amazing flavor! The entire family will love this hearty meal in one. Hey hey it’s Tiffany from Creme de la Crumb! It’s no secret I’m a little bit obsessed with my slow cooker – or I should say slow cookers because I think I have five of them??? I just got a new one for Christmas and I’m so excited about it, I use my slow cookers several times a week and when we are having a family get together I usually have a few in use at the same time. This is a great go-to weeknight staple dish. 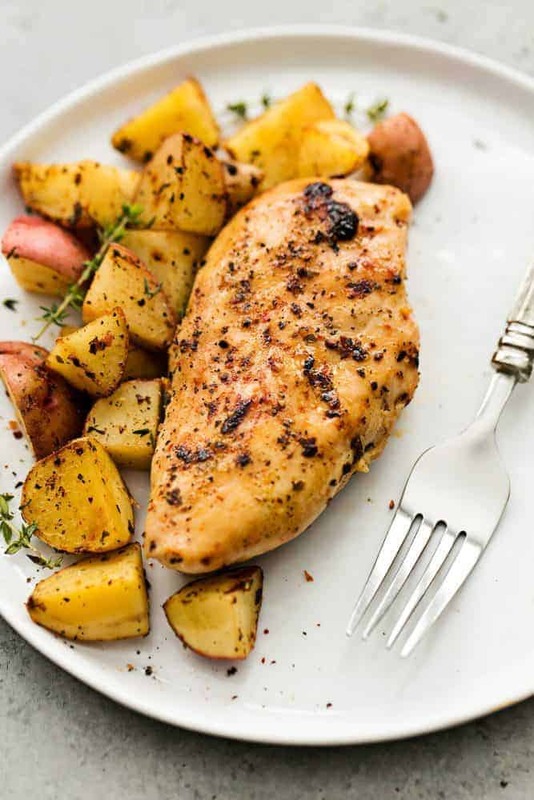 I love the flavors, it’s really healthy, and I never get tired of chicken or potatoes. The best part? It’s chicken AND potatoes made in one dish at the same time. It’s awesome! Even picky eaters are a fan of this simple crockpot meal. I hope you enjoy it as much as my family does! In a large bowl combine chicken and potatoes. Drizzle with oil and stir to coat. Sprinkle salt, pepper, garlic powder and Italian seasoning over the chicken and potatoes, then toss to coat well. 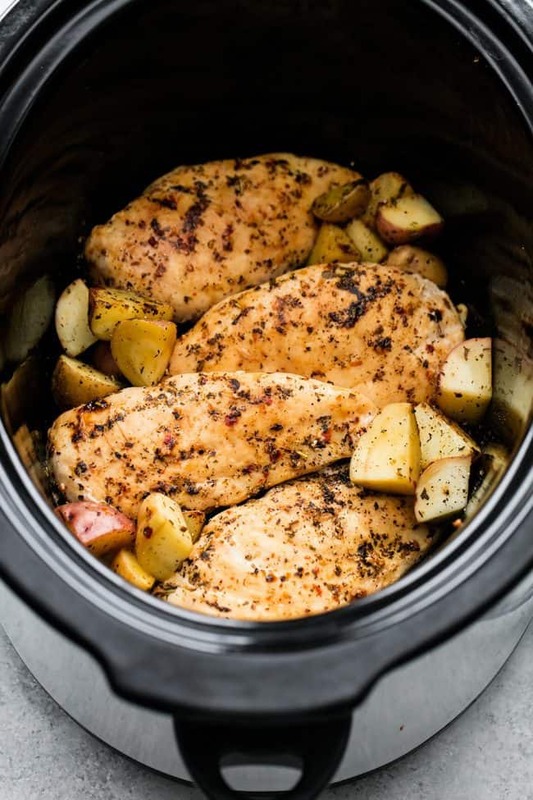 Transfer to slow cooker (OR optional step: cook chicken and potatoes in a large skillet/pan over medium high heat for 2-3 minute to brown before transferring to slow cooker to cook all the way through), cover and cook on low for 4-6 hours until chicken is cooked through and potatoes are fork tender. Garnish with fresh herbs like oregano and thyme (optional) and serve hot. I made this tonight and it was SO good. I added about 3/4 cup of chicken broth at the beginning and cooked it all on high for 4-5 hours. If came out perfect! Beautifully moist potatoes, chicken that falls apart. Served it alongside roasted brussels sprouts, and it was such a nice, hearty dinner. And so easy! Thanks, guys. Did you add the potatoes all together with the chicken broth?? What is Italian seasoning blend? Can I double this recipe? Will that increase the cooking time? When you say for chicken breasts, do you mean full breasts or where they come and have some? It looks like in the picture. Thank you so much! Yes, you are welcome to double this recipe. The cooking time will need to be adjusted and added time to cook all the chicken thoroughly. I changed this recipe by substituting 2 minced cloves of garlic instead of garlic powder, one 14oz can of tomato sauce to the pan for scrapings of chicken and potatoes and garlic. I also added some onions, carrots, mushrooms to the skillet to brown, a half cup of red wine to deglaze and a tablespoon of sugar. I cooked it all on the stovetop for 2 hours until the carrots and potatoes were done. It was delicious. that is not “changing” the recipe. that is inventing your own. you didn’t even use the crock pot. so you’re giving yourself 4 stars. which is needless to do on someone else’s recipe. The potatoes were perfect but the chicken came out really dry. I will add liquid if I make this again. I would recommend it being defrosted. I have frozen chicken breasts in the freezer and I’d like to make this tomorrow. Can I use frozen chicken breasts and if so would you adjust the cooking time? You can, I would recommend thawing it out beforehand but you can add an extra hour. Super late but if you cook on high one hour than reduce to low for 6-8 you can use frozen chicken. Hi! If you use chicken thighs, should you go boneless, skinless? I would recommend bone in for a more tender, juicy chicken but the boneless, skinless would be best and more chicken too. What setting should I have my crockpot on? I like to use low for 4 to 6 hours. I live on my own but also work so I love using my slow cooker! and some to take for lunch next day! Really good! I added the chicken broth as suggested in other comments. I didn’t have Italian Spices either, but had half a bottle of Italian dressing leftover from summer and used that-worked fine. Should I be using thin chicken cutlets or regular? Doesn’t specify what type of oil to use. Is olive oil okay? Or would grape seed oil be better? Yes, olive oil is great! Would drumsticks work well with this receipe? I probably should have cooked the dish in a skillet a little bit beforehand to sear it because this turned out unfortunately very bland and mushy. Maybe if you double up on the seasoning it’s good or adding other seasoning in addition to. How do you think this would freeze before being cooked? Like prepping it, freezing, defrosting and then throwing it in the slow cooker? 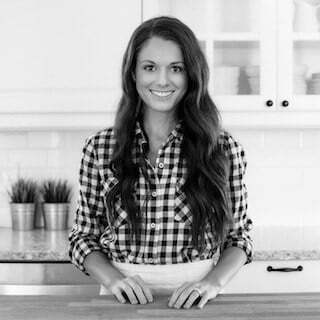 Im looking for freezer recipes to prep before i give birth! Yes, but you will want to check them sooner since they cook quicker and become softer than a russet potato.I love red potatoes and that would be delicious! Great idea! Can you add carrots and green beans? I’ve got one child who won’t do potatoes. Should I add more of the seasonings? Why not mix it all in the slow cooker? I don’t understand why you would necessarily want to mix it all in a separate bowl. I had a question, and it may seem stupid but you didn’t say add any water to the Crock-Pot, is that intentional?? Do you not add water??? I love using my pot but I’ve never used it without any type of liquid base, so can you please explain to me? I plan on trying this tomorrow for my kids! I’m making this for supper tonight. It looks yummy. I omitted the potatoes because I can’t have them. I added the chicken stock someone else had in their comments and decided to add diced tomatoes with green chilies. Everything else the same I can’t wait til it’s done it looks good. This recipe is so simple and delicious! This is my second time making it over the past 3 weeks. The first time I followed the recipe exactly and it was excellent. This time, I added a sweet potato and a little onion. It’s great exactly as the recipe shows and is also a fun one to play around with a bit! its in the pot now….anxious to feed the fam tonight! I did the growing first in cast iron skillet. I am giving it a 5 star cause I can get the taxes done without interruption and the combo of spices and pre growing smells and looks delicious! It came out great! I had corn and s Sunflower crunch salad as sides and we loved it! I put the chicken with the potatoes and added half a cup of chicken broth along with other seasonings. I used two packets of Italian seasoning as well. Cooked on high. Mine was done in about 2.5 hrs. That sounds great! Thank your sharing and following along with me!